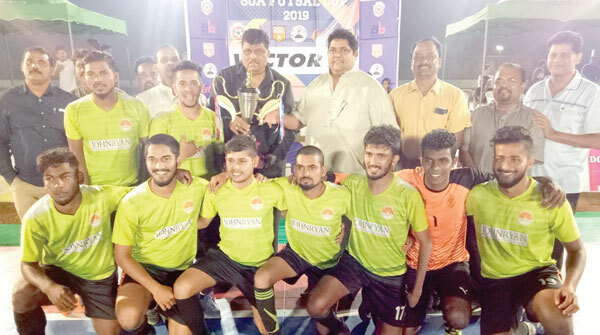 FATORDA: Limon FC got the better of Lazy Boys FC 5-2 to clinch the Goa Futsal Cup organised by Futsal Association of Goa, at Don Bosco ground Fatorda, recently. Sachin Patil scored a hat-trick while Steven Fernandes netted a brace for the winners. Alvito Miranda netted a brace for Lazy Boys FC. The match was equally balanced in the early stages but Limon FC totally dominated Lazy Boys FC and hardly gave them any chance to score in the first half while scoring two goals in the first half to lead at the break. In the second half, Lazy Boys FC were awarded with a penalty which was converted but Lazy Boys couldn’t capitalise on the opening as Limon FC outclassed them in every department by scoring another three goals to emerge victorious. In the women’s final, Ritu Girls defeated GOL BRASIL by a solitary goal. Both teams failed to convert the chances until the dying minutes of the game when Khusboo Saundatikar scored the match winner. GFA president Churchill Alemao was the chief guest and gave away the prizes to winners and runners-up in the presence of Curtorim MLA Reginaldo Lourenco, GFA officials and other dignitaries.